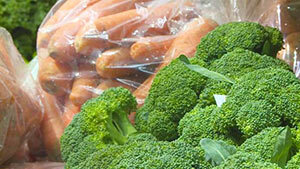 A new program in Madison is aiming to encourage healthy eating habits and it all starts at the doctor’s office. NBC15 news recently spotlighted the new Fruit and Vegetable Prescription (FVRx) program at the UW Health Northeast Family Medical Center. The pilot program, which launched February 1, helps clinic patients who have food insecurities gain access to fresh produce. Up to 150 program participants will receive coupons that can be redeemed for up to two dollars of fresh fruits and vegetables at any Willy Street Co-op store. They receive 10 coupons per month for six months. The FVRx project is a partnership between Willy Street Co-op, UW Health Northeast Family Medical Center, the City of Madison, Public Health Madison and Dane County and Second Harvest Foodbank. It’s funded by a $23,000 grant from Wholesome Wave, a national group working to make produce available for all. Special thanks to faculty lead and clinic medical director Russell Lemmon, DO, clinic social worker Olga Arrufut-Tobon, LCSW, and front-desk supervisor Debbie Setzske for their work to get the program up and running.